“Miss, come see my streak,” said Isaiah,* sitting at a computer and fully engaged in a Lexia grammar lesson. Isaiah, like many of his peers, benefits from the immediate feedback the computer program provides him during Literacy Intervention Block. He is practicing building compound sentences, a skill we reviewed in a small group the day before, and Isaiah boasts a streak of 57 correct answers (so far). Students in Isaiah’s literacy intervention are reading 2-3 years below grade level and use the Lexia PowerUp program to address gaps in their reading skills. 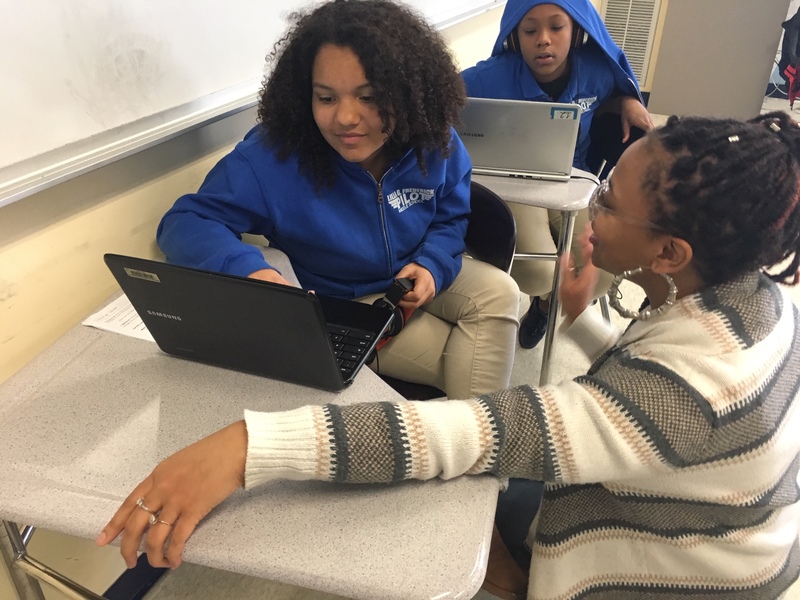 Next door, students work on projects that extend the Humanities curriculum, currently focused on Greek myths, to the myths of Ancient China and Egypt. Students read and analyze new myths and do research projects on their country of origin, and present their projects. This Goalbook Mini-Projects Intervention is for students who tested at or above grade-level in reading. Across the hall, students are doing a cold-read of a text. To begin, the first student–Clairson*–reads aloud for a minute, When the timer beeps, he marks where he stopped and continues until the end of the passage. Later, he and his partner, Franky,* will calculate words per minute. The partners switch roles and Franky reads to Clairson, who times. Franky has a lower reading level than Clairson and, when Franky gets stuck on a word, Clairson points to it and decodes. Franky repeats the word and then continues reading. In content class, Franky is hesitant to read aloud. In intervention, he confidently takes risks with his reading. Franky, Clairson, and the other students in this intervention are using a curriculum called STARI (STrategic Adolescent Reading Intervention) lesson, designed for students reading two or more grade levels behind that targets both basic reading skills and the skills that underlie deep comprehension, such as academic language, perspective-taking, and critical reading. At the end of the last school year (2017-2018), 97.6 % of students at the Lilla G. Frederick Pilot Middle School read below grade-level. This problem of low reading levels was further evidenced by low grades, poor motivation, and lack of independence. Systemic consequences are at play for students who cannot read at grade level, including fewer career opportunities and lower life expectancy. But what are the root causes of such low levels of literacy success? One of the roots of this problem is a lack of skills among teachers to assess need and provide literacy instruction. Another is that students do not get systematic, research-based intervention. Using the Teacher Leadership Grant, we confronted both of these challenges. To address a lack of skill and training for teachers, a small team of cross-content teachers committed to develop their own knowledge and expertise in adolescent literacy. The team began work over the summer, reading two texts (Teaching Reading in Today’s Elementary Schools by Roe, Smith, and Burns and Speech to Print by Louisa Moats), attending a two-day seminar at Massachusetts General Hospital’s Institute of Health Professionals, and meeting for a day-long retreat to synthesize our learning and set goals. During the school year, this team took charge of examining data and placing students into appropriate interventions, as well as facilitating all outside partnership with literacy organizations such as 826 Boston, Renaissance, Lexia Learning, the Isabella Gardner Museum, Excellence for All, the Massachusetts Consortium for Innovative Education Assessment, MGH Institute of Health Professions, MobyMax, GoalBook, and Boston Partners in Education. The team also developed and implemented literacy PD for the rest of our staff. Next, the team delivered research-based, informative professional development for all Frederick teachers so that students will benefit from strong literacy practices in all classes. We began our PD at the end of last year in an hour-long literacy workshop and have facilitated ten more hours of programming so far, ranging from looking at student data to planning literacy instruction for individual classrooms. We will deliver at least four more hours of high-quality literacy PD before the school year ends. 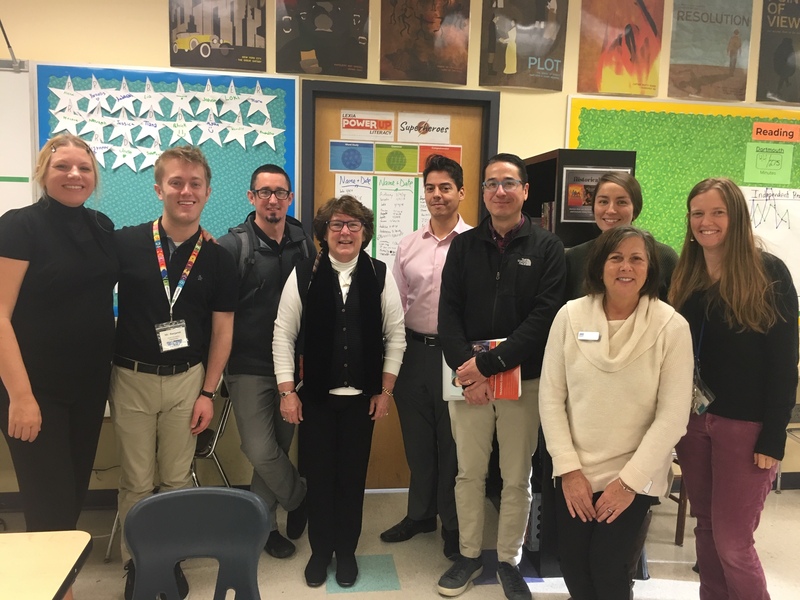 In our last professional development, the group comprised of elective, science, and SLIFE teachers met together and shared literacy strategies across content and grade level. One SLIFE teacher shared exactly how he pairs images and vocabulary words for his newcomers so that the Physical Education/Health teacher could use the same strategy. Another teacher asked the group for ideas for how to move students from high quality discussion to high quality writing. Several teachers in the room recommended resources on that topic. Before leaving, each teacher committed to use a new literacy practice in his/her classroom with the intention of reporting back on progress in our next session. To address the need for systematic, research-based intervention, the literacy team led implementation of school-wide, research-based reading intervention. To do this well, we investigated literacy intervention programs and selected several to use with different student populations. Each sixth and seventh grade student has a protected 45-minute intervention period at least four times a week, mostly in groups that are smaller than their regular class sizes, guaranteeing more targeted attention. All teachers conferenced with students about their reading level and their reading skills, and students set goals for their own growth in particular domains of reading. At the January benchmark students made gains in Lexile Level and more specific reading skills (word recognition, vocabulary, syntax, and reading comprehension). Some studies suggest that average growth for a middle school student over a year should be 70-80 lexiles. Our students who started the year reading below a 4th grade level had an average reading gain of 109 lexiles in just three months. Students in the MobyMax intervention grew, on average, 11 percentile points in word recognition. Students in the Language Live intervention grew, on average, 12 percentile points in reading comprehension. 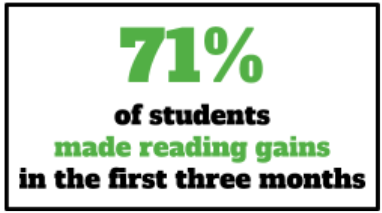 Of our students who started the year below grade level in reading, 71% have made gains. We still have many questions to answer about teaching literacy skills to adolescents. And, we know that this work takes time. This project is just beginning, and, although we have encountered challenges, we can see literacy growth both in our data and in our school’s mindset about literacy instruction as a priority in all contents and for all students. *All student names have been changed. This year, our school-wide instructional focus at the Lilla G. Frederick Pilot Middle School is about increasing students’ reading levels. Our Instructional Leadership Team collaborated on the writing of this statement, an important promise to our students – reading at and above grade level. Educators in all content areas will use benchmark and formative data to plan and implement instruction that deeply engages students in reading, writing, speaking, listening, and creating, moving toward all students reading at and above grade level. Yesterday, our Summer Literacy Team met after a summer spent reading – we landed on Moat’s Speech to Print and Roe, Burns, and Wade’s Teaching Reading in Today’s Elementary Schools (9th edition). These photos capture the sharp thinking of our team of Boston Public Schools’ Educators. I am excited to use writingisthinking.org as a platform to document our work throughout the year. Why use stations for reading? When we started planning this unit, we had so many texts that we wanted to use and so many activities that we wanted to do with each reading; it was overwhelming. Also, as seventh grade teachers, we confront a few problems pretty consistently when we teach whole-class mini-lessons: 1) the same few students are engaged, and even when using calling sticks, turn-and-talk, or other engagement strategies, all students are not participating to the fullest extent; 2) texts need to be substantially differentiated for different levels of readers, which is difficult to do when the class is reading together, and 3) many of our students rely on us, their teachers, to tell them that their work is acceptable or correct before moving on to the next step. 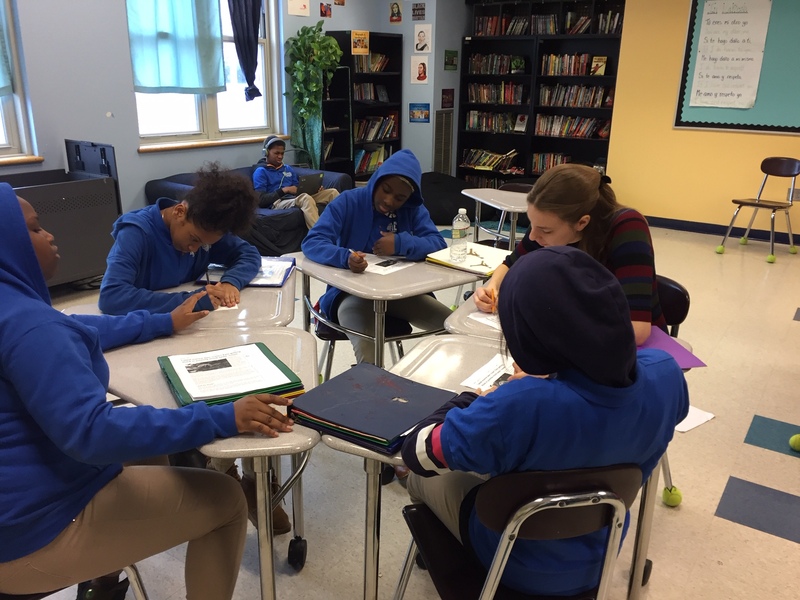 A stations format for classwork, especially when stations can be tailored for the different groups, addresses each of these dilemmas and pushes our seventh graders toward independence and confidence in their academic work. When structuring station work, especially at the beginning of the year, we scaffold the “how” of stations by going over expectations and directions each day, projecting a timer, delegating student jobs, and, at the end, doing both a small group and a whole class reflection about how well station work went on a particular day. For each set of stations, students receive a packet (which may be differentiated depending on whether students are grouped homogeneously or heterogeneously) with the same four expectations. Right underneath the stations expectations, there is a stations report card. At the end of stations work, students grade themselves on that report card. If the stations go for two days, the second day they grade with a different color. We have found that reviewing the expectations each day supports student success, and, at the end of station work, a teacher circulates as students are reflecting to give warm feedback as well as one thing that a group can work on to improve their “group work grade” for the following day. On the second page of the stations packet are the stations expectations (only four to keep it simple) and station jobs. Students assign jobs within their groups, and the expectation is that the following day, each student has a different job. This allows students to share responsibility, compelling kids to push themselves out of their comfort zones and/or allowing students who would usually be leaders in a group to step back and support the leadership of other students. **Note: When reviewing station expectations, number 2–plan your time–is the one that we teach into the most. This step forces students to read all the directions, break down the task, and estimate how much time each step will take. Before we added that step, we noticed that students were using their time to do the task, but that they were not moving as quickly through the work as they could have been. This step puts momentum into their group work and, since adding and teaching it, we have observed many more completed station packets. “Exile” Reading Station: At this station, students read Julia Alvarez’s “Exile” for comprehension. They did a gist-related stop n jot at designated stopping points (that we had penned in ahead of time) and answered some After Reading Questions. “Exile” Theme Station: This station had a teacher present to read the text aloud and review the comprehension questions from Station 1 to ensure that understood what they had read as a group at the first station. Then, students were guided through the scaffolded theme-finding process that we had taught whole-class the previous week. This gave us as teachers a better gauge of where students were in their ability to independently find theme and comprehend the text independently. “Immigrants (We Get the Job Done)” Symbolism Station: Here, students watched the music video from The Hamilton Mixtape’s “Immigrants (We Get the Job Done)” by artists Keinan Abdi Warsame, Claudia Alexandra Feliciano, Rizwan Ahmed, Rene Perez Joglar, Lin-Manuel Miranda, and Jeffrey Penalva, using printed lyrics to follow along. They then answered four questions related to symbols that they saw in the music video and a fifth question about the video’s overall message. March Evidence Sort Station: At this station, students read an excerpt of John Lewis’s graphic novel March I. After reading the excerpt, they examined 8 pieces of preselected evidence to determine whether it was relevant to the claim “It is important to break the rules to fight for equality.” Students sorted the evidence into relevant and irrelevant categories, and then noted their choices in the station packet. Then, they put a star by the strongest piece of evidence in the relevant pile before putting their materials away and moving on to station 5. “Gate A-4” Theme Station: Here, students read aloud the short story by Naomi Shihab Nye, answered a few comprehension questions, and then as a group generated three themes of the text. Independently, each student chose what he/she thought was the best theme and wrote a short paragraph explaining why. Theme Computer Station: Each of our schools uses computer programs for ELA mini-lessons with the intention that these lessons and the practice that follows can be individually differentiated based on a pre-assessment given by the program, which is then followed up by benchmarks each quarter. These computer programs (MobyMax, Study Island, etc) each have a section on theme, which students completed at this station. **Note: With the exception of station 6, each station ended with the question “What border(s) did ____________ cross in this text? What challenges did _________ face when crossing? Use evidence from the text to justify your answer.” This uniting question allowed us to review the station work together as a whole class, anchoring our discussion in the core questions of the overall unit. These stations took two days to complete (21 min/station with 2 min of transition time and a do now at the beginning of the class time). At the end of the first day, each group completed the report card and then we gave written feedback with a plus and a delta (one improvement that they could make) that students reviewed before starting stations the second day. Students also got a grade for their group work each day and an overall grade for their written work (in the packet) after the whole activity was completed. Because station work is so independent, it is important that teachers “see” students as they are working and deeply look at particular parts of the station packet to monitor the content and skills that students are working on. We chose to focus on the question about border crossing at each station to make sure that students were connecting their work to the greater work of the unit. We also discussed the themes of “Exile” and “Gate A-4,” as well as some of the symbol questions in the music video. These discussions not only validated the students who had completed all the work at stations and had done deep thinking about the text (those scholars got many participation points during the discussion! ), but also allowed the kids who had been in different groups to bring their small group discussions to the whole class so that their ideas could be heard, expanded upon, and refined in a bigger group. We created an anchor chart of themes from these different stories that we referenced when beginning our memoir writing unit the following week. **This is the first in a four-part series chronicling how our learning on our Fund for Teachers trip manifested in our classroom instruction. In our travels this summer, one of the questions that kept popping into our minds and our conversations was “How can we get 80 kids–40 in my room and 40 in yours–to create one, cohesive mural?” With our first mural, “I AM…YOU,” we played around with several of the answers to that question. Supported by local art non-profit Art Resource Collaborative for Kids, students created a composite mural, each designing a symbol based on an aspect of their individual identities. They then painted their symbols in black over a white background to create the first mural, I AM…YOU. The creation process took four weeks. In the first week, students learned about symbols and practiced creating their own. We had a discussion about what symbols represent Boston, students’ home countries, students’ interests, etc, and how to combine those symbols that people already recognize to create powerful new symbols that represent complex identities. In the second week, students chose the symbol that they were going to contribute to the mural and re-drew it to make it clearer and more detailed. Our teaching artist, Will, and other team members from the ARCK collaborative took all the symbols with them and collaged them together to create one piece of artwork. A small group of students got together between the second and third week to trace the symbols onto giant panels–that is, to scale them. Students projected the image onto the panels and traced them with permanent marker. Some students also primed the panels with whiteboard paint so that, when the symbols and phrases were added in black, the public would be able to interact with the mural by drawing on it in colorful whiteboard markers. Finally, the last two weeks students spent painting symbols onto the panels. A few weeks later, the mural went up in the City Hall Plaza for Boston’s HUBWeek, a collaboration between The Boston Globe, Harvard University, MIT, and Massachusetts General Hospital that showcases, celebrates and convenes the most inventive minds making an impact in Boston and around the world. Our students took public transportation to downtown Boston to see their creation on display for the city. They were intrigued by all that the public had added with whiteboard marker, and added their own touches before leaving to explore HUBWeek’s other exhibits, which included life-sized board games such as Connect Four, light displays, and one booth where kids got to look at their own cheek cells in a test tube. ARCK’s display included not only our murals, but also interactive fiber artwork. Students had a great time exploring HUBWeek and meeting each other at our picnic lunch in the Christopher Columbus Waterfront Park. **We the teachers–Kat Atkins-Pattenson and Alice Laramore–could not have possibly done this project with such integrity and skill without the support of ARCK, the Art Resource Collaborative for Kids. The members of the organization were integral to our teaching, and we thank them profusely. This year, instead of a publishing celebration with food and a stage for students to stand on while reading their writing, I tried out a new approach: the Whole-Class Poem. The gist of the celebration is that each student chooses the best line (best can be defined by the teacher, by a rubric, or by the students) to add to the whole class poem. We begin by sharing the lines. Then we read the poem aloud. Students offer changes to the order of the lines, and we read through it again. We repeat the order-adjusting step until we all feel satisfied with the sound of the work. Then, we do read in unison. For the first full week of school, my students read “My Name” by Sandra Cisneros. Together, we analyzed the text for meaning, structure, and style. After, I modeled how to brainstorm ideas for each of the three sections in the piece, and then brainstormed about their own names and drafted a My Name piece with three sections. Students then draft their pieces based on their brainstorms, and I have writing conferences with each. This gives me a better pre-assessment of where their thinking is and where their writing is, so I can problem-solve around closing the gap between thinking and writing, and push both forward. We revise and edit, using the same structure as Speed Publishing Week. Then, we celebrate! Every student reads aloud at least one sentence. Every student reads the finished pieces of four other students. Our class experiences the draft-revise-final writing process in real time, together. To begin, the desks and chairs, usually situated in groups of four, were rearranged into a large circle. Each student found the desk with their name on it and sat down with their final draft, reading it silently in their heads. After three minutes of silently reviewing their own drafts, I taught them about the post-it compliments that we use to praise one another’s writing. All students wrote their initials in the corner of five post-its. I introduced students to three sentence stems they could use to comment on one another’s writing. We practiced writing two compliments together for a selected piece of student writing–I chose one that had a few mistakes, and we practiced pulling out the positive. Then, each student moved three desks to the left. They had four minutes to read work and write their compliments. We rotated through four different drafts. Students could use their fifth post-it to write an extra compliment for a draft when they had extra time. Finally, students returned to their own drafts and read through their compliments. In the second phase of the celebration, we created a whole class poem. The title of the poem was “Our Names” and the byline was the class’s cohort title. First, each student used a colored highlighter to highlight the most descriptive line from their writing. Many students were guided by their peers’ compliments. For example, “The most descriptive part of your writing is…” stem supported students who were not as easily able to choose the best line for themselves. After highlighting, the whole class stood. I asked students to raise their hands if they thought that their line would be a good start for our whole class poem. That student read her line out loud and I typed it into a google document that was being projected in real time. After reading, that student sat and the student on the left of her read her best line. We repeated this pattern until every student had contributed a line to our whole-class poem. Once the poem was drafted, we moved into the revision stage. One student volunteered to read the poem aloud, and other students were prompted to listen for lines that could be moved to make the poem flow more naturally. As the student read, other students were tracking with their eyes and making mental changes based on the projected poem. After the read-aloud, four students suggested changes, and I copied and pasted in the google draft to accommodate their recommendations. We repeated the read aloud and revise process one more time to get a final draft. Once we had a final draft, we did a choral read of our whole class poem, and the next day it was posted on the bulletin board for the whole student body to read. Each student contributed a piece of their writing to the whole-class work, and each student could proudly explain the content of the board and how the work was created. Not only had students completed one piece of writing in the first two weeks of school, they had contributed to two, framing writing as a large part of the work that we will do together throughout the seventh grade. At the beginning of each school year, all teachers have the responsibility to build a classroom community that is a safe place to learn and grow, to make mistakes and take risks, to make new friends and try out new sides of oneself. I find that I come to know students better as whole people by engaging them in writing tasks that encourage them to share dimensions of their stories and identities. What’s more, when the time for celebrating finished pieces of writing arrives, students have the opportunity to learn new things about one another, to ask questions, and to find similarities and differences that encourage an empathetic classroom. This sets us up for a year of productive learning and growing as a community.